CASA DE PIEDRA VISTA, EN EL CENTRO DE SOLIVELLA (Tarragona), DE 270 m2. CONSTRUIDOS, BAJOS, LAGARES SUBTERRÁNEOS, PISO DE PIEDRA CON LOSAS DE 1,5 Y 2 X 1 m., BODEGA, ENTRESUELO Y DOS PISOS, DOS BALCONES, PATIO INTERIOR Y TERRADO. CASA DE PEDRA VISTA, EN EL CENTRE DE SOLIVELLA (TARRAGONA), DE 270 m2. 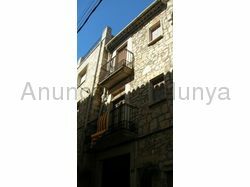 CONSTRUÏTS, BAIXOS, CUPS SUBTERRANIS, TERRA DE PEDRA AMB LLOSES DE 1,5 I 2 X 1 m., CELLER, ENTRESOL I DOS PISOS, DOS BALCONS, PATI INTERIOR I TERRAT.